Nature has amazingly design the masticatory system in such a manner to meet the functional demands in a very physiologic manner. Our occlusal, cervical, airway and postural system has been pre-determined genetically to function optimally relative to earth’s gravitational forces. An angled or slanted occlusal plane is natures design when the head is properly supported by balanced muscles. Because of gravity, the muscles of the structural system as well as the masticatory system allows the human being to function with the head in properly balanced manner to avoid strains and fatigue to the overall postural system. A person with a forward neck posture will accommodate to maintain the flow of oxygen into his/her body. This forward neck and head posture tendency is indicative of an upward head tilt with a resulting flatter occlusal plane. The upward head tilt contributes to TMD and accommodative pathologic issues (e.g., shoulder pain, neck pain, temporal headaches). This upward head tilt is the bodies way to accommodate due a mal-aligned bite which tries to defy natures gravitational vertical forces, resulting in a flatter more leveled occlusal plane which does not represent what nature originally intended in its design. The SN (Sella-Nasion) Plane is noted in the dental literature as a standard objective leveling reference. What you see in the lateral ceph below is one of one of my patients, male age 47 who presented with former TMD cervical neck problems. Symptoms were resolved with an orthotic. The previous upward head tilt responded positively to the orthotic therapy allowing nature to correct it’s head posture including and an improved occlusal plane. Based on this corrected and more normalized occlusal plane orientation as seen in the below lateral cephalogram I want to transfer this occlusal plane orientation to a flat analyzing table on my articulator to fabricate the upper and lower restorations for FM rehab esthetically and anatomically. It seems to me that if SN plane is level, symptoms are gone, and patient’s head is now balanced. Recording this position is the most logical to communicate with the lab to mount the case. During the bite registration stage. 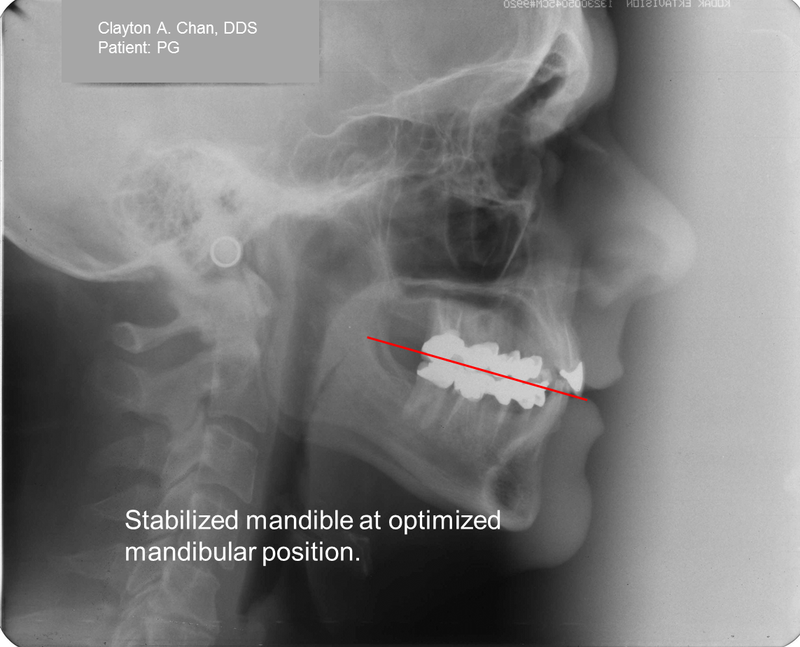 If one use computerized mandibular scanning (jaw tracking – eg. scan 4/5 with TENS) and does not have adequate training to accurately interpret and record this kind of neuromuscular bite registration error can occur before the case is even started. If the EMG interpretation is not correct and one implements erroneous EMG diagnostic protocols (unable to decipher the differences between fatigued EMG patterns vs. normalized EMG patterns or does not monitor the cervical group EMGs believing that these EMG recordings are the same as SCM EMG recordings one will be greatly mistakened. Subjective interpretation in these areas of diagnostics will also lead to failed treatment results. 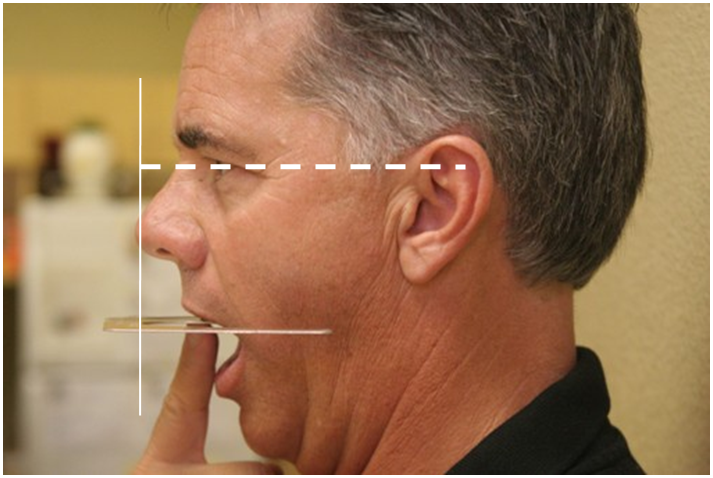 I believe in using good artistic and scientific clinical judgments to record head levelness like any diagnostic protocol, using the Modified Fox Plane technique as I have formerly indicated is a simple, inexpensive and effective tool every dentist in North America can use. (By the way, every dental student has been issued a Fox Plane in dental school as a basic learning tool). Note the angle of the occlusal plane. (These are real time pictures that I routinely take during my clinical work up to document what I actually observed). Note how the maxillary recording is simply recorded at level using fast set PV on the bite fork of the Fox Plane and the transferred to a level table. This nicely correlates with the lateral ceph occlusal plane which objectively confirms the mounting and occlusal plane transfer. 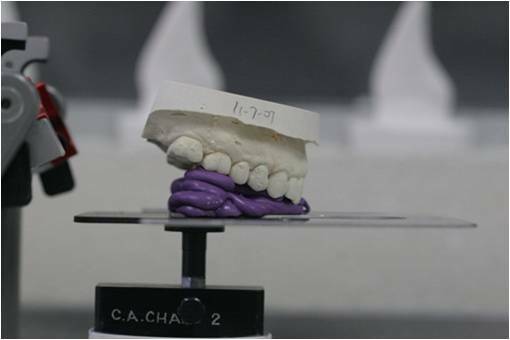 The maxillary cast is simply transferred to the table via the OPI (occlusal plane index) from the Fox Plane recording. 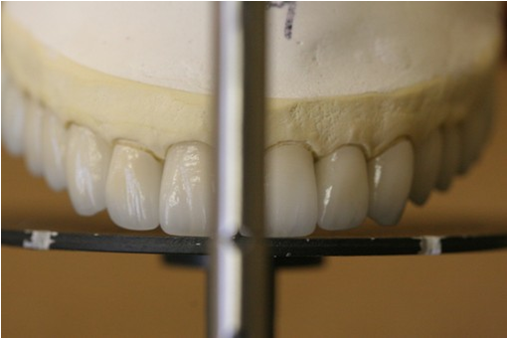 (Read more on Mounting the Maxillary Cast Using the Fox Plane and Occlusal Plane ). This is the actual photo that some skeptics have tried to alter to disparage the modified Fox Plane technique I have been advocating. (Important Note: In the background the level counter and bottles sitting on top shows that my patient’s head is leveled. The bottles and level counter top are not slanting and or angled as some scrupulous “instructor/teachers” have tried to convey in their lectures by altering this image in their lectures to distort the truth of my Fox Plane recording). Level = Level! In a purposeful attempt to disparage and misconstrue the facts of my published article, a dentist instructor “teacher” of a “cosmetic NM teaching center” used this picture and altered and flipped it in an attempt to discredit my teachings during during his lectures. What is amazingly wrong with his attempt is that he failed to fully read and comprehend the article that was published in the ICCMO Anthology (Chan, CA: A Review of the Clinical Significance of the Occlusal Plane: Its Variation and Effect on Head Posture: Optimizing the Neuromuscular Trajectory – a Key to Stabilizing the Occlusal-Cervical Posture. International College of Craniomandibular Orthopedics (ICCMO) Anthology VIII, 2007). His biased publicized lecture subtitle shown in the below power point slide shows his unscrupulous dishonest disregard for scientific and academic teaching integrity and is in itself a “contradiction”. Additionally, it shows his lack of knowledge and understanding of basics in lateral cephalograms. This is the altered and flipped picture by this “occlusion teachers” with the accompanying text. Below is the unscrupulously altered photo by the same dentist (instructor “teacher” of an institute) who purposely altered my photo again in a second power point slide (by rotating and altering the above photo) and used it without permission in a manner to give a misleading and false impression to the attending listening doctor audience about my occlusal plane teachings and understanding of how I advocate the use of the Fox Plane. 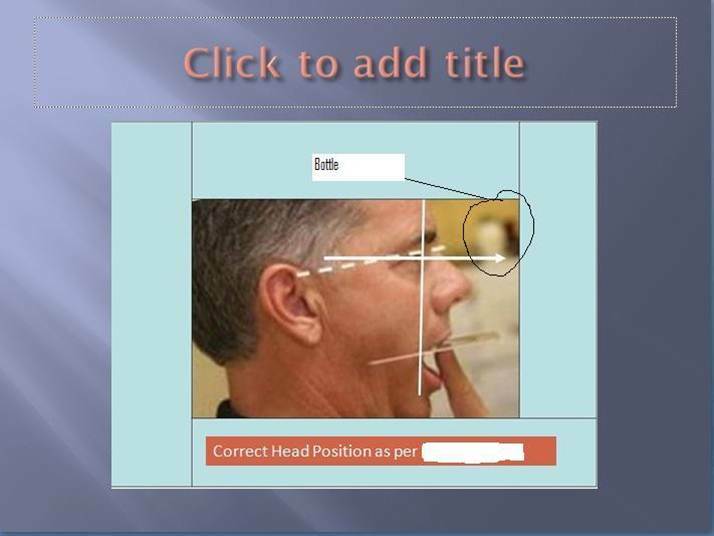 One of my dentist colleagues discovered and reported this poorly mishandled power point slide exposing this doctor/ “teacher’s” credibility as an “occlusion instructor” by pointing out in the background the tipped bottles that were positioned on a counter in the background. 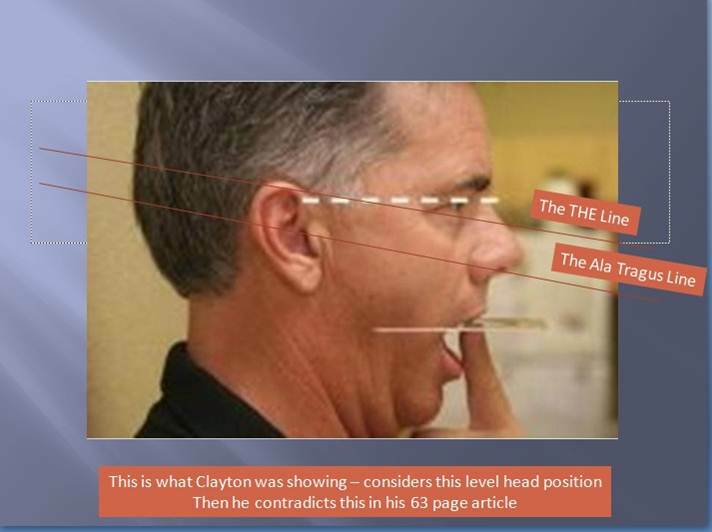 The unethical teacher/lecturer purposely rotated the photo to mislead, misguide and convey a false teaching about me and what I believe about head posture, the maxillary occlusal plane orientation and what I consider as horizontal level. The lecturer/ “occlusion teacher” has exposed his credibility and lack of academic honor. Such stupidity does not go unnoticed by those who have astute eyes to see beyond what is obvious. Postural balance is maintained best when the head, neck, shoulders, pelvis and feet are leveled to Earth’s horizontal level. Dentists and the viewing audience clearly recognize what level is and realize that the angled human occlusal plane is simply determined when the dentist can clearly see things from a balanced perspective – not from a distorted biased and altered view). The unposed head posture clearly shows the natural angled occlusal plane of the same patient in this lateral cephalogram. 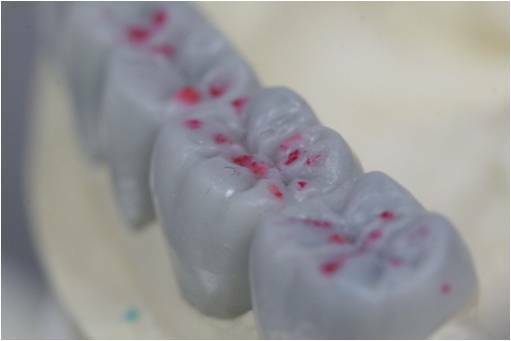 The wax up was done to match the mount using the maxillary transfer table. 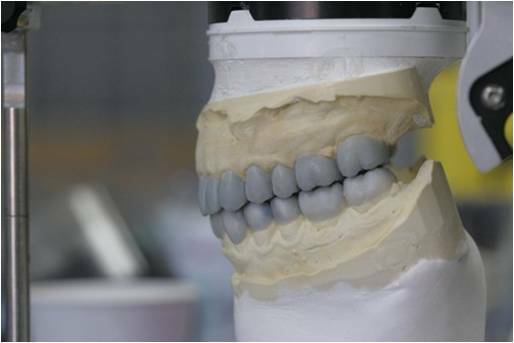 Restorations were fabricated to the same mount without alterations to the mount. (Dr. Chan proudly gives recognition for outstanding ceramic and waxing to Las Vegas Esthetics Lab, Ray Foster and Team). I check the crown ratios (they shouldn’t look funny)…reconfirm my AP…check my patient’s subjective responses. Many dentist and I have discover that when the correct occlusal plane is properly managed, the patient doesn’t experience any neck, cervical and shoulder pain problems. If one uses the classic HIP (hamular notch and incisive papilla) method to manage the case too completion that many are discovering that this can lead to unresolved TMJ/occlusal problems. If everything seems to line up I go for it! I mount my cases and check my cases from the lab to see if they maintained the correct maxillary orientation before delivery (labs are not allowed to cheat or change the mount unless it is wrong). I check my mount. I check the photos, I check and compare what is in the mouth, I check how the angle and slant is…I analyze and re-analyze and confirm with my lateral ceph, check my EMG data (making sure my patients are comfortable and stable), I check my Scan 4/5, scan 2’s, scan 8’s, etc. and decided that this orientation got to be right from the frontal and lateral views….then a re-check the patient and I re-check at the lab bench…. Seems right to me! I am happy…that He is happy…. “Don’t lose sight of the Power of the Bite!” I have no regrets about the Fox…because I know it works for me and it works for all the talented clinicians who understand this concept. 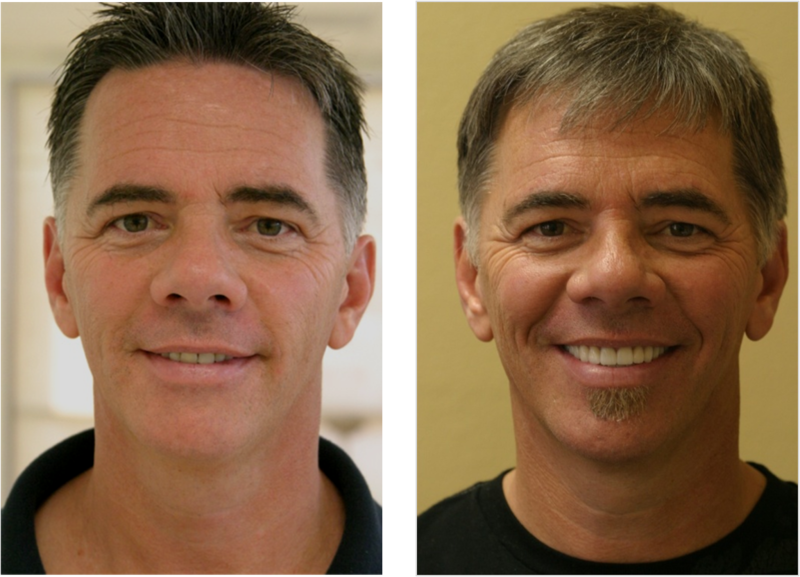 These pictures are immediately after lower seat, before any adjusting of any crowns….I had the patient come back the next day to TENS and refine the bite. My patient is very pleased, no neck cervical TMD problems. The bite is awesome. After gneuromuscular esthetic dentistry the patient no longer reports cervical pain, no shoulder pain, nor any TMD issues. The patient is stable and very happy. He is a public speaker and is on streaming internet video weekly and has a great pleasing smile. You can view him at: http://www.iclv.com/ or spiritflow.net on Sunday mornings and Sunday evenings. Although, there is some dental literature that tries to indicate that the occlusal plane is parallel to certain boney references as the hamular notch and incisive foramen) they often do not realize that cervical bones from C1 to C7 are not perpendicular, thus misleads and confuses the reader as to which horizontal they are refering to. 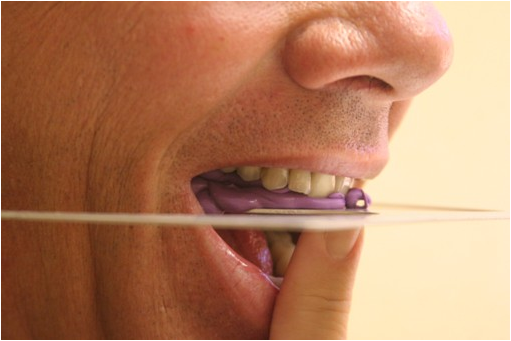 Dental literature both in the orthodontic, restorative and prosthetic arena clearly have reported on average an occlusal plane angle of 6-14 degrees when the horizontal gaze is parallel to earth’s horizontal level. 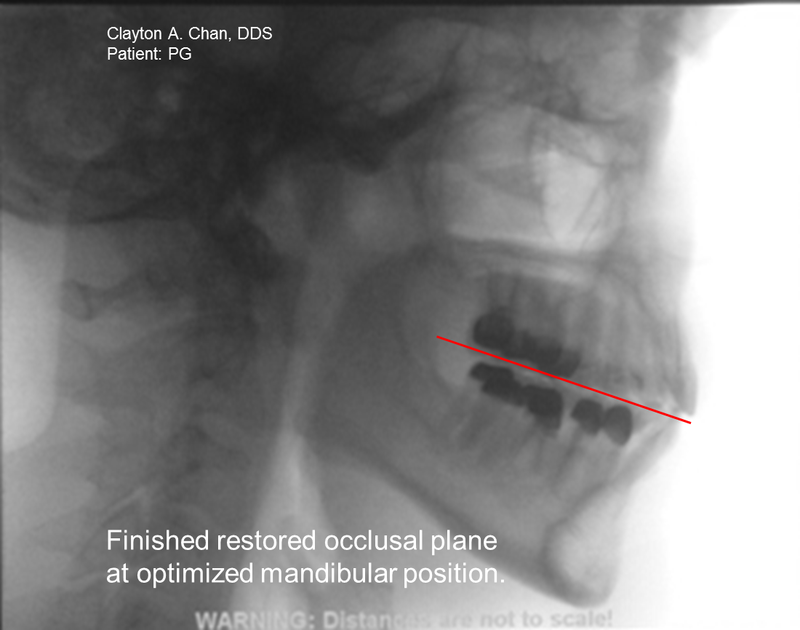 Any dental referencing technique that advocates an occlusal plane horizontal to earth’s horizontal plane certainly is contributing dental failure and postural/occlusal instability. A physiologic occlusal plane, determined by balanced cervical neck, shoulder and masticatory muscles of the head is routinely angled by natures design to be perpendicular to a normalized lordotic curvature of the neck from C1 to C7. This orientation is physiologically sound according to natures proportional design for optimal function of the pharyangeal airway (breathing), optimal head posture for physiologic functioning and positioning of the lower jaw, and proper shoulder posture. Proper mandibular positioning relative to the cranium does effect and impact body balance, flexion, extension and rotational movements. Dentists have ignored physiology far too long and have destroyed much with their hands, what nature has spent years growing and developing. A flat occlusal plane relative to horizontal level represents mal-alignment and dysfunction contributing to body fatigue. Neuromuscular science supports normalize occlusal form. If clinicians ignore what nature intends they WILL be building fatigue into their cases. You cannot fool physiologic and anatomical science, especially when it is tested amongst thousands of great clinicians who understand the realities of conservative, ethical and thoughful judicious “gneuromuscular/neuromuscular” treatment for their patients. As you all know I take a lot of records and this is just a small sampling of what many have been privately emailing me to show what I do. Some may not agree, but I am fine with that. My patient is extremely happy and satisfied. 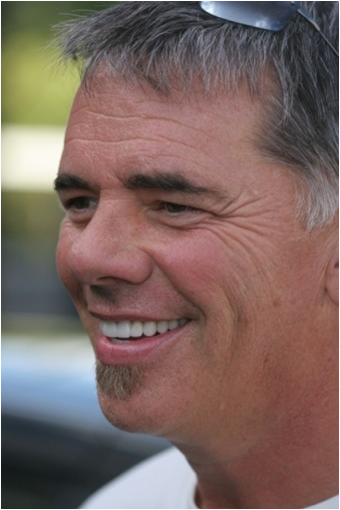 The occlusal plane should look natural and balanced with the smile (that is how it should appear)…the mount is what tweaks our minds…the lateral ceph objectively confirms the reality, but it may be a need for a paradigm shift in occlusal thinking and re-evaluate whether your occlusal plane mount is too flat or not. It’s worth investigating. 1) We ultimately desire the cervical neck muscles balanced, thus we observed that the head tilts downward from an upward pathologic TMD position which TMD patients present with (flatter occlusal plane relative to horizontal level), 2) we desire optimal esthetics smiles lines and our patients to be asymptomatic. 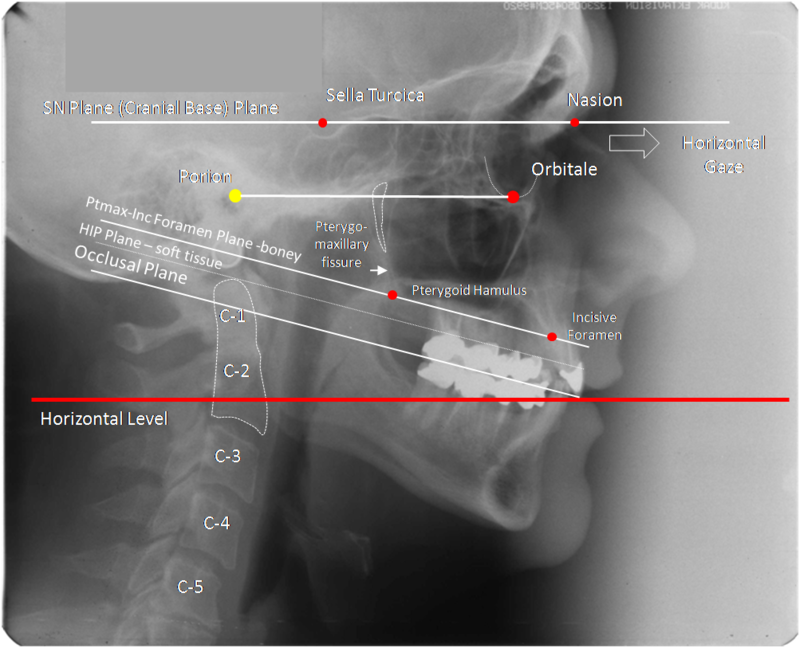 We observe on lateral cephalograms that the occlusal plane is angled – no symptoms and 3) we simply desire to reproduce what we actually see in a stable, symptom free system – angled occlusal plane, and not have our lab technicians guess or alter the mounts, thus the Fox plane method we advocate as many recognize as simple and logical is easily transfered via the Fox Plane method indicated at Occlusion Connections.